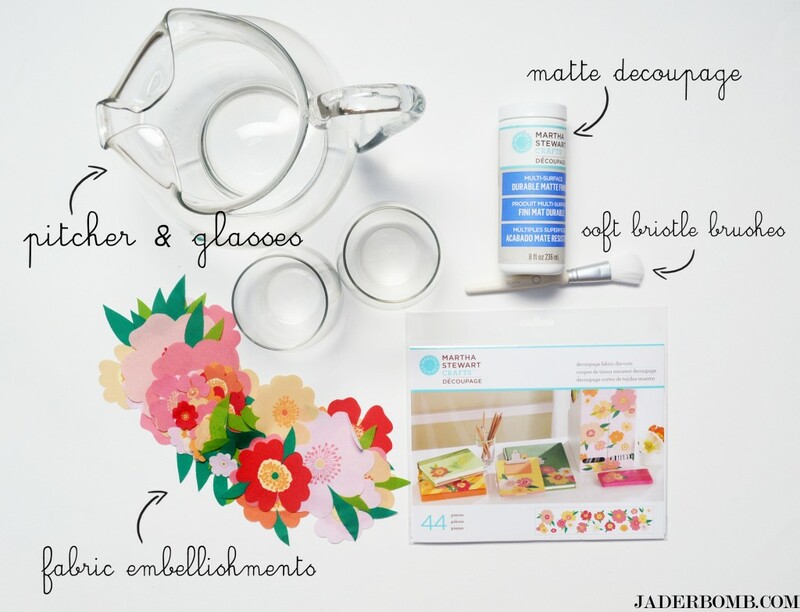 This month the world came to a sudden halt with the launching of this product —> Martha Stewart Decoupage. 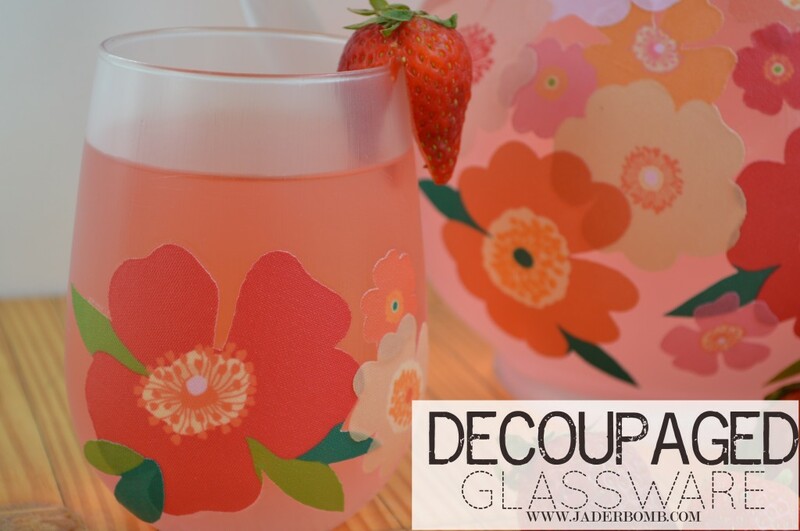 Decoupage on glass? Why yes, this will become your next secret addiction. This is not like your everyday decoupage, y’all. It’ the cream of the crop. I purchased my pitcher and glasses from Target and they were completely affordable. That is always nice, incase you mess up 3 times. I have to admit, Martha Stewart consistently impresses me but she really did it with these fabric flower embellishments. Pre-cut, why YES THEY ARE! 1) The first thing you will do is grab a little rubbing alcohol clean the surface. This will take care of those greasy little fingers that just touched it. Wear gloves if you feel like touching it. 2) Grab your Durable Matte Finish Decoupage and roll that sucker on a flat table to mix it up. Please, for the sake of all the bubble makers out there don’t shake. We want to keep the bubbles in bubble-land not in the decoupage bottle. 3)Grab your soft bristle brush and apply a thin layer over the section you will be placing your flower. Don’t over do it, we just want to apply where the flower is going to be placed. 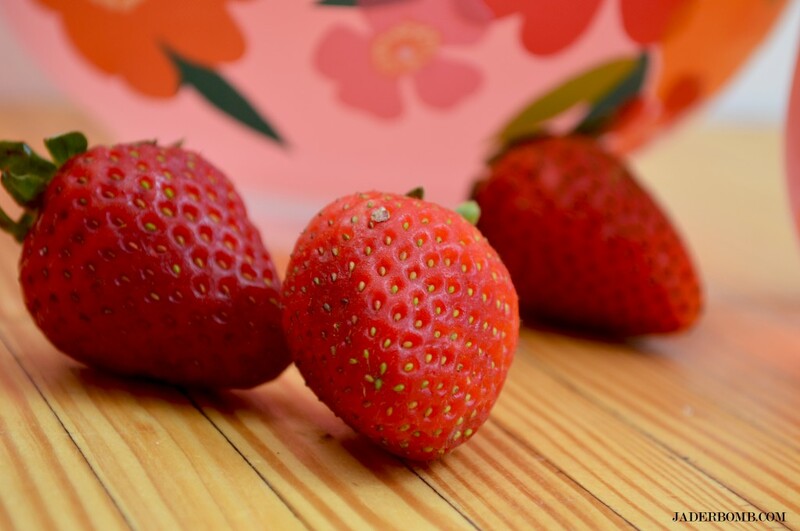 4)Quickly grab your flower and place it on top of your thin layer. Brush a light coat of decoupage on top to make sure it’s secure. Apply as many flowers as you want. Make sure you work at a good pace so the decoupage does not dry. The fabric embellishments are easy to put on however if you decide to use paper make sure to rub your finger over them to get any hidden air bubbles out. Set aside and let dry 1-2 hours. 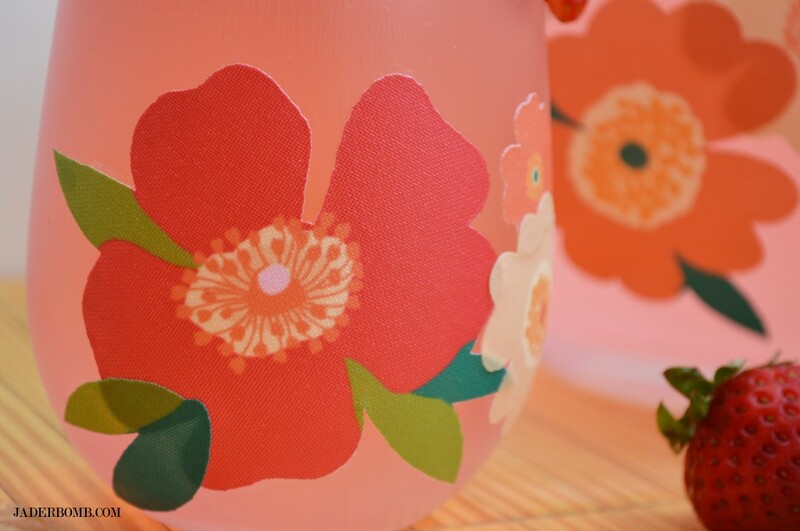 When dry, the Durable Matte Finish Decoupage looks just like frosted glass. I almost flipped in my chair when I went back to look at them. I may have blurted out a few curse words that were purely out of excitement. 5) When you are finished applying your flowers get the 1 1/2 in 3.81 cm soft bristle brush and apply a thin coat over the entire glass. It’s important that you brush in the same direction when applying your final coat. 6) When done let them air dry 2-3 hours. 7) You can put as many layers as you want just make sure you allow drying time in between each layer. 8) Set this aside for 21 days to cure completely and guess what, this will be dishwasher safe! 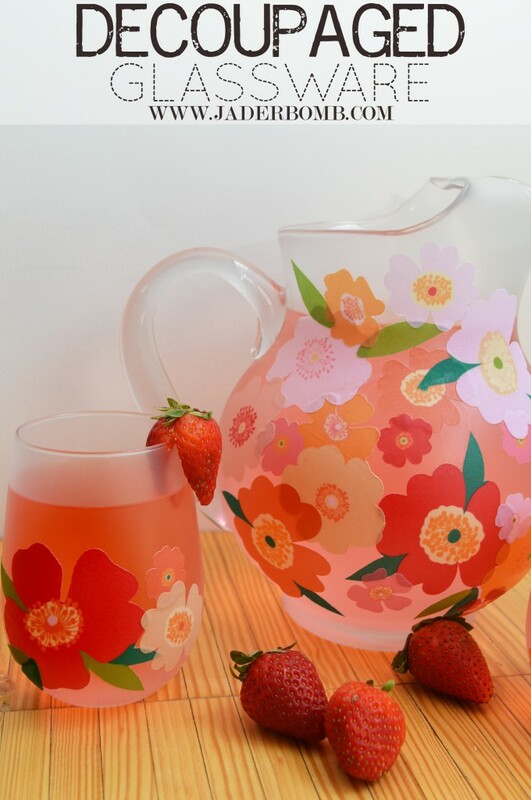 You can really see in this picture how the decoupage looks like frosted glass. It is beautiful! I ate these while I crafted and they were yummy. Want one? I hope you enjoyed this post. I had a blast playing with these new products. BTW: these decoupaged glasses look cute on anyone! 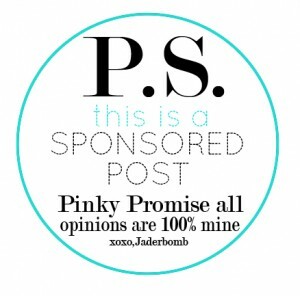 This is a sponsored post through Blueprint Social and Plaid but all opinions are 100% my own. For the complete line of Martha Stewart decoupage at Michaels. Visit Plaid on Facebook, Twitter,Pinterest, or their blog. Trust me they post great things daily! 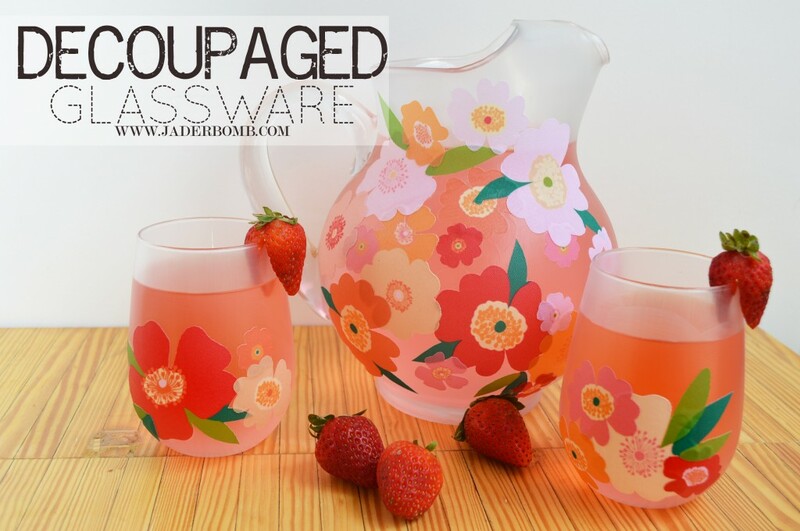 You decoupaged glasses and pitcher are so inspiring! I am excited to try that myself. I saw some cute Martha Stewart cut outs at Micheals, this is such a great way to use them. Perfect house warming gift too! Erin: I agree! They really are so cute! Very pretty! Looks like it was painted on! Thanks Steph! I am really in love with them! this looks great. Not being American, I can’t get Martha Stewart craft products. Can you tell me what this stuff actually IS? Is it like Mod Podge or more like decopatch glue? Wendy: It is GREAT! You should check out some of my links because you can order online! It’s sorta like Mod Podge but it’s dishwasher safe which is a little different from Mod Podge! Hey Jill! Yes! But you HAVE to let them cure for the entire time! I actually let mine sit a few days extra! Jill! I have! I actually let them sit a few days extra just to be safe 🙂 I hope you enjoy them cause they are all so precious! Such a great and simple idea! They look wonderful! Where is this pitcher and glasses from? HI andrea! I got them from Walmart! This is GENIUS. Thank you for sharing. I will be sharing on my blog as well! Thanks Maren! Nice to meet you!! !